Learn more about Ayano Aishi, the protagonist and murderer of the Yandere Simulator video game. In this questionnaire game, she will ask questions to which you must answer more briefly to know what character you could be in your successful videogame. You better give him some answers that convince him or you will end up murdered by this girl who is a little deranged by the love she has for her Senpai. If you want to check what you are capable of, answer no to your first question as to whether you are ready to start and you will see what you can do with people who do not like you. 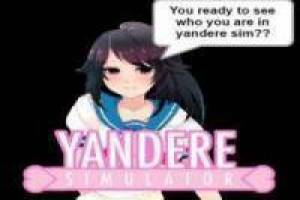 Enjoy the game Ayano Aishi the Yandere Simulator, it's free, it's one of our Yandere Simulator games we've selected.